Paperback Warrior: The Rat Bastards 01 - Hit the Beach! 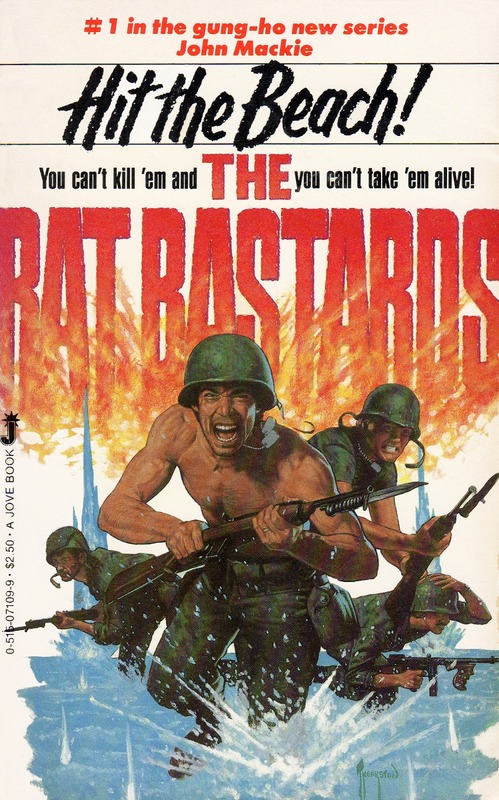 'The Rat Bastards' was a 16-book run of World War Two action-adventure novels. It was written by Len Levinson under house name John Mackie (one of his 22 pseudonyms) and follows his first, similar series, 'The Sergeant'. Where 'The Sergeant' was set in Europe, this series is set in the South Pacific. 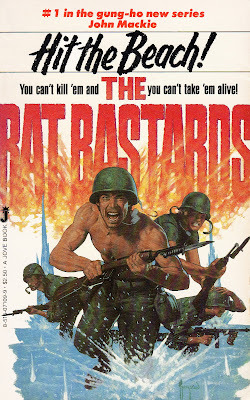 The first book in the 'Rat Bastards' series, “Hit the Beach!”, released by Jove in 1983, introduces its characters as they arrive at Guadalcanal for what will be an incredible ordeal of desperate hand-to-hand combat. The events in the book span only a couple of days, but the intensity of the fighting is conveyed extremely well by the author, who also has a gift for rendering realistic dialogue. Our Rat Bastards platoon kills a staggering number of Japanese soldiers, far more than a critical reader can really accept, but that goes with the territory. And what bloody territory it is! The magnitude of gory violence here makes Edge look like Gene Autry, but it’s blended with some well-crafted suspense and atmosphere too. Len Levinson is clearly right up there with Don Pendleton for creating powerful, visceral pulp. Outstanding. The entire series is available as ebooks through Amazon (along with 'The Sergeant' series). The author does recommend reading them in order to preserve the story.